Our primary objective is to enforce the wildlife laws of Sierra Leone and provide a safe and natural haven for rescued chimpanzees with the ultimate aim that in the future they can be released back into the wild. Most chimps that arrive at the sanctuary are less than five years old and would normally still be suckling milk from their mothers. Many are mistreated by their owners, injured, malnourished or disabled; they have been abandoned or illegally sold as pets. In most cases the mothers, and sometimes the family, have been hunted as part of the illegal bushmeat trade or as a result of human-wildlife conflict and their young have been sold as pets by the poachers (research from the Jane Goodall Institute identified that between 5 – 10 chimpanzees die for every surviving rescued chimpanzee). Due to their small size, the young chimpanzees are worth more alive than as bushmeat. All of the chimpanzees arriving at Tacugama have suffered some kind of mental trauma as a result of the violent separation from their families and many come with physical injuries such as wounds from shotgun pellets or machetes. Once a chimpanzee reaches Tacugama it passes through several rehabilitation stages. Chimps share 98.6% of their DNA with humans and are very susceptible to many human sicknesses such as the common cold, polio and TB. New arrivals have often spent extended periods of time in close contact with people and may have been infected. They undergo an initial health check and then spend a minimum of three months in our quarantine area as some illnesses cannot be detected immediately. It’s important that we not only nurse our new arrivals back to full health but also that we protect our resident chimpanzees from the risk of infection. During their time in quarantine the chimps are closely monitored and undergo monthly detailed examinations as well as being inoculated. A specially trained member of our care staff acts as a surrogate mother for these young chimps – she carries, plays, comforts and help feeds them. 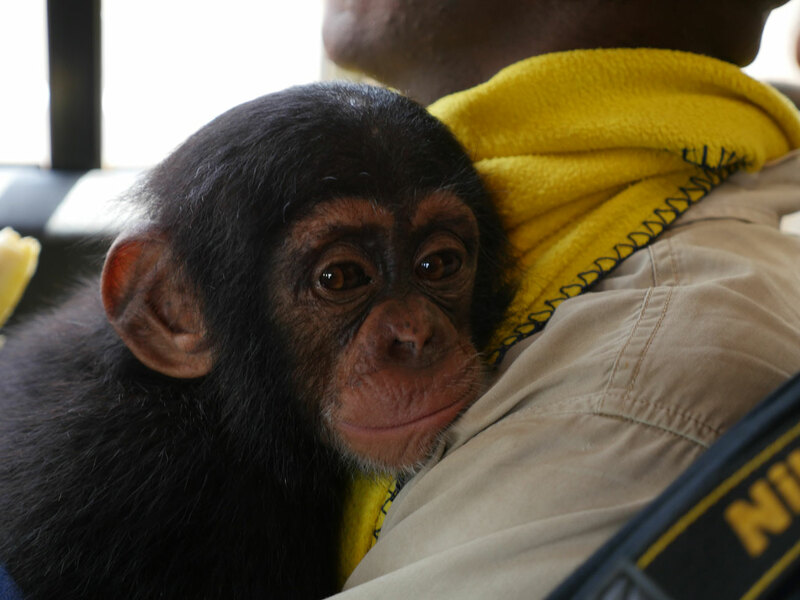 Her role is critical in alleviating the mental trauma and stress of our young chimps. We also ensure that our chimps are eating a more natural and healthy diet at this stage. Often before rescue the chimps are fed the same as their captors; the staple diet in Sierra Leone is rice with sauces such as cassava or potato leaves. Some come to us having been fed beer and given cigarettes. Young chimps in the wild would learn what to eat and how to eat from their mother and their family but few of our chimps have had this chance. We start to teach them what they can eat and provide them with substitute milk. Once the vet gives the release from quarantine, it’s time for our arrivals to make some new friends! Chimpanzees are born into family groups that can range significantly in size from around 15 to over 100 members. As the chimps at Tacugama are not related to each other we have to take time to allow new arrivals to form bonds and become a member of one of our existing groups. Generally the younger the chimp, the easier it is to integrate. The surrogate mother introduces the chimps in the quarantine area with each other to form small groups of 3-4 baby chimps. This is where they first start forming friendships and start behaving like chimps again by playing together. We introduce our chimps to electric fence so that they do not try to touch them when they are in the enclosure. Our electric fences in the enclosures are of a high voltage to completely discourage the chimps to attempt an escape. Once our chimps have been successfully through the quarantine area, the role of the surrogate mother decreases and we gradually introduce the chimps to peer groups, where the chimps within the group take over the care and comfort function for the new arrivals. The introduction is done by placing the new chimp behind metal bars in one of the enclosures. Different members of the group then investigate the new chimp. After several days, if the group accept the new chimp we then let the new chimp into the enclosure and closely monitor the behaviour of the family for days. Each chimp is introduced to a group depending on its size and age. Chimps are very territorial and do not always welcome new members and hence the newly introduced chimps are closely monitored to ensure they are not bullied or picked on by their peers in their new group. If we observe that one particular chimp is having a tough time in the group or is disrupting the harmony, then we try to change them into a different group.